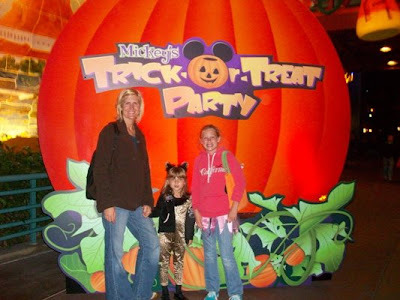 My girls and I recently had the pleasure of attending Mickey's Trick-or-Treat Party at California Adventure. Last years event was such a blast we were delighted for the invite again. With each passing year outings like this get more and more fun (and easy) as the girls are older and more independent. The energy, excitement and stamina of a 5-year-old makes the late night galas (like this one) much more enjoyable for everyone. Disneyland in all it's season grandeur offers Halloween Time- a festive transformation of both Disneyland and California Adventure-from Sept 26th through Nov 2nd. Mickey's Trick or Treat Party is the 'costume party' part of the gig. It's Disney's way of celebrating this spooky time of year, in a not-to-spooky way. Thank you Mickey for offering a family friendly (non scary)celebration of the season. We enjoyed our evening at the party so much as music and dancing were happening around every corner. Characters danced and played around the park. There's nothing that screams October like doing the chicken dance with big blue Sully from Monsters Inc. Am I right? And there were star sightings a plenty. Good times. The actual trick-or-treat stations were dotted around the park (they give you a map to find them) where there were sweet AND healthy treats available. Yes, there were bags of apple slices and carrots, raisins, etc. I really appreciate the healthy offerings and my children were a lot better off snacking on the fruits and veggies, believe me. 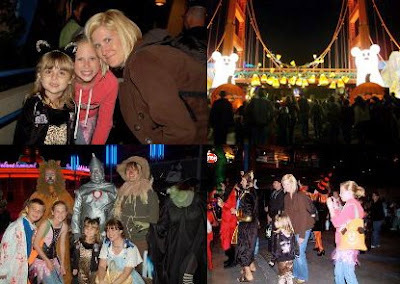 You've only got a week or so to check out Halloween Time and only a few select dates (Oct 28, 29, 30, 31) to attend Mickey's Trick-or-Treat Party so head on down to the Happiest Place on Earth and have some Halloween family fun! Man that must of been fun- to see all the kiddos in costumes. Hello- I was at Mickey's Trick or Treat party as well. I just found you through Bee Studio and I am very excited to see you are in Orange County as well. Me too! Your blog is amazing. I'll be back!